David Pollard was a member of the AusIMM for 58 years, having joined in April of 1961 as a Student in the first year of his Diploma at the Ballarat School of Mines and Industry. He was the youngest person to ever join the AusIMM at the age of 16. David lectured metallurgy for 14 years at the University of Melbourne and for 7 years with the South Australian Institute of Technology (now UniSA). He was Education Manager for the Australian Mineral Foundation (AMF) from 1988 until 2000 where he greatly expanded the scope of the professional development program. He was also chair of the AusIMM Adelaide Branch in 1988 for a period then again in 2007 and 2008, finally resigning from the Committee in 2015. 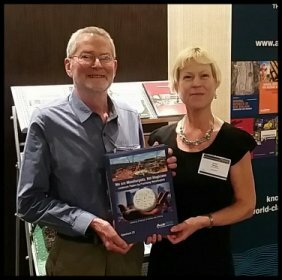 He spent many years championing the project to publish a revised and updated edition of the 1993 work, Australasian Mining and Metallurgy (Monograph 19 – the Sir Maurice Mawby Memorial Volumes), and this publication was launched with great success in 2013 as AMMOP - Australasian Mining and Metallurgical Operating Practices. Notably he was also a big part of the Metallurgical Society for 11 years, Chairing MetSoc from 2008 to 2013. He was elevated to Fellow Grade in 2008 and, in 2011, was further recognised as an Honorary Fellow – the most esteemed grade within the Institute. David also brought the Metallurgical Plant Design (MetPlant) conference series to the AusIMM when AMF closed, and convened this successful series with Geoff Dunlop from 2002 to 2015. In 2016, David approached Janine Herzig to hand over the reigns of MetPlant, they convened a very successful 2017 event together and also launched the AusIMM spectrum “We are Metallurgists, Not Magicians” which was a project initially undertaken by David and Geoff, that Janine was able to help fast-track in 2016/17 to ensure a launch in 2017 in both hard and soft copy format. David passed away with his family by his side in Adelaide on August 12th, aged 73.